Facebook Site: To access the Baldwin City Blues Facebook site go to Facebook and type Baldwin City Blues in the "Search Box." It will come up as an "open group." Ask to join and you will be approved to view everything contained on the site. The Mid Plains League Board of Commissioners have announced that the 2018 Mid Plains League All Star Game will be held on July 5, 2018 at the Community America Ball Park in Kansas City, Kansas. 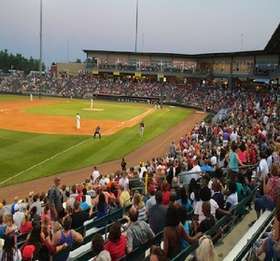 Community America Ballpark is the home to the Kansas City T-Bones of the American Association. 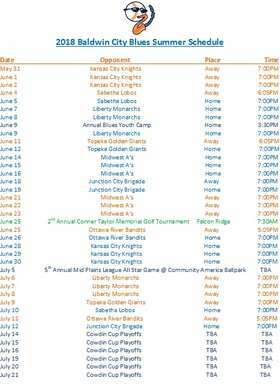 Planned events include the Mid Plains League Home Run Derby and Special Fan Funtasticks. Last Summer's Game at beautiful Somerset Ballpark in Sabetha, Kansas was highly enjoyable....but who could forget the classic finish of our 1st All Star Game when Baldwin City Blues Catcher Tyler Moore helped put the Mid Plains League on the map? Click above if you missed it the 1st time. 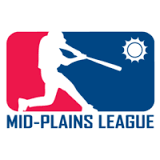 Baldwin City and the Mid Plains League. Where the finest baseball players in the Midwest call home.